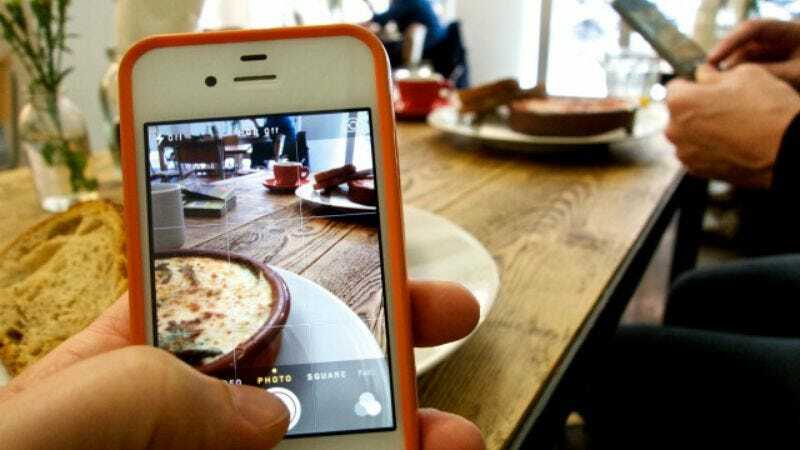 Those who are in the habit of savoring their meals by first rubbing them in the faces of their Instagram followers are about to feel somewhat vindicated: The CBC reports that taking pictures of your food before consuming it can actually make it taste better. The news outlet cites a recent study in the Journal of Consumer Marketing, which found that the time spent tilting and photographing, say, your plate of Scottish salmon served with a parsnip purée creates a “momentary active delay in consumption,” which then heightens your appreciation of the herbed cream sauce and roasted root vegetables. That “momentary active delay” sounds similar to delayed gratification, except that there’s only the slightest lapse of time between the act of restraint and the act of feasting. But it’s reportedly just the ritual that enhances your dining experience, even as telling your friend that they’re in your tiramisu’s light probably downgrades theirs. And with that, a round of ramen shots (photos, not drinks) just went off—sans overhead lighting, of course. Unfortunately, snapping a picture of your brownbag lunch won’t actually make your leftover tuna salad taste any better, as the study found that Instagramming diners only enjoyed a meal more when its delectability was pretty much guaranteed. According to the CBC, “under normal conditions, this effect only works for indulgent food”—think perfectly-sliced sashimi instead of some congealed corned beef. That’s why photographing a trip to the newest izakaya will do more for your tastebuds than just slapping the Valencia filter on a picture of your gas-station salad. But while photographing the artfully arranged tendrils of calamari from your local, non-Michelin-starred eatery won’t make them any less chewy, there is some good news for the non-foodie population (which is most of the population), as well as anyone who wants to enjoy (and/or brag about) clean eating. The researchers conducted three studies, and one of them found that the “perceived difference between healthy and indulgent foods” began to melt away like so much Gruyère (sorry, it’s lunchtime) thanks to a little positive reinforcement from your social media community. So not only did the participants of that particular study begin to perceive healthy foods in the same manner as the indulgent ones—i.e., irresistible—but their enjoyment was also increased by the shared experience of eating healthy. And if self-satisfaction can power cars, there’s no reason it can’t also make baby carrots mouthwatering.